It seems today that the world is increasingly harsh and cruel. Anger is stirring, and rightly so, but violence cannot be the answer, can it? Surely, Marvin Gaye said it himself! But peace isn’t enough either, it’s simply too daunting a task for such a decentralized movement to take on peacefully. But what can we do? It seems as if today’s political field is a series of forking roads, all with dead ends. I don’t know about you, Kim K, but I’m gonna invite a bunch of cops to hang, and we’ll bro out over the crisp and refreshing taste of Pepsi soda. We can all agree that the United States of America, nay, the world, is forever indebted to Jenner for that incredible service. Do me a favor and give Kanye W my mixtape. 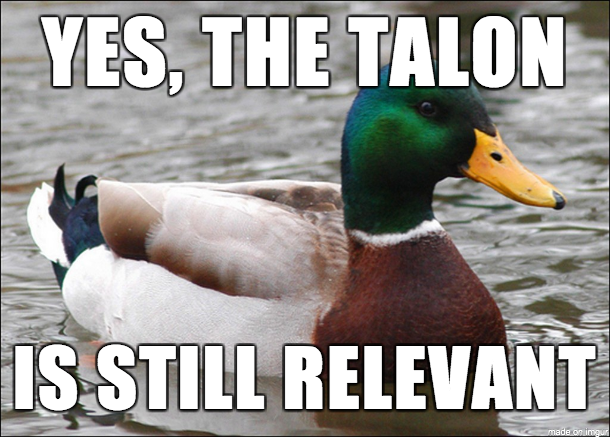 Is the Talon still relevant? I feel like the answer to this question is very subjective, but to me, love is when you find that person who you know will never give you up, never let you down, never run around and desert you. In all likelihood, your consciousness will just recede into the void, and you’ll just be gone. On the bright side, it’s just as likely that that won’t happen. We have no idea what the origin of consciousness is, so we have no idea what will happen when it’s lost. But the important thing to remember is that you lived a great life. You found a job that you loved and you enjoyed working with your colleagues. Maybe you found an art you enjoyed so much that you committed your life to it. Sure, you didn’t make much money, but you enjoyed every second you spent creating. You read every book you could read, you listened to every album you could find, you watched every movie you could watch, and you played every game you could play. You might have found a significant other, and you filled their life with joy, and they filled yours with joy as well. Then you died somehow, and something happened to you, but we don’t really know what. What we do know is that you lived a long, happy, and fulfilled life, and that’s all you should really worry about. I really wasn’t expecting such a serious answer for such a sarcastic question. I sort of answered this in the last advice column, but I can still give you some advice on this as well. To maintain honor roll, it’s really just a matter of putting more time and effort into studying and working on projects/homework. It’ll be rough, but if you want it badly enough, you’ll make that commitment. Most, if not all, of your teachers are willing to put some of their time into helping you out if you don’t understand a concept. Of course, you’ll still have some designated summatives or a test late in the quarter that you’ll end up getting a bad grade on. In this case, get over it, determine why this happened, learn from it, and do better in the future. Now I’ll repeat what I said last time: straight A’s and honor roll are just a representation of how well you’re doing. In my experience, at least, most students view their grades as a score, but this perspective just fosters anxiety and unnecessary stress. Now, while I realize that getting honor roll can help pad your college resume, it still won’t hurt your chances of getting into wherever you want to go in the slightest if you fall off for a quarter or two. How does one take effective notes when reading a textbook? It really depends on how you learn. Just ask any creative type— no doubt they’ll tell you that they take notes in doodles or some other disorganized yet charming way. However, that probably doesn’t work for you. Alright, now that the type Bs have stopped reading, I can give you the real answer. Cornell notes are the superior note taking technique, hands down. Get a bullet point or two per paragraph, and then put any highlighted or bolded terms in the margin on the left. Then after taking notes, write a summary at the bottom. This is really the most important part, because it cements what you’ve learned in your mind, and then when you go back to study, you can just read the summary and go over concepts you forgot or don’t understand. However, Cornell notes are a double-edged sword— if you want good material to study, you have to write comprehensive summaries that cover every large concept in your notes.